Leading local cancer charity, Action Cancer is celebrating its corporate partnership with their retail outlets locally based textile recycling partner All-Tex Recyclers. This sustainable partnership has clocked up over £166,000 of support and the milestone has been marked by All-Tex Recyclers sponsorship of six collection vehicles. The collection vehicles are used by Action Cancer to collect donations of clothing, furniture and bric-a-brac across Northern Ireland, which helps to stock Action Cancer’s 13 shops across the province. Peter Lynch, Action Cancer’s Retail Manager said; ‘Action Cancers retail outlets are an integral part of the cancer charities fundraising activities and are the public face of Action Cancer, having a strong corporate relationship with a recycling partner is key to the success of profitable shops and increased revenue for saving the lives of people who are affected by cancer in Northern Ireland’. Paula Mc Auley, Business Development Manager with All -Tex Recyclers, stated; ‘We are delighted to be working with a leading charity like Action Cancer. 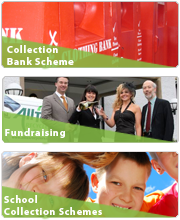 At All-Tex Recyclers we have a commitment to invest time, energy and resources into all of our charitable partners and look forward to developing future schemes in conjunction with our long term partners’. This venture highlights All-Tex Recyclers’ corporate commitment to invest heavily in the charities it supports and the expansion of this partnership will most certainly grow and develop in the months to follow, so watch this space! If you would like to find out more about All-Tex Recyclers please contact us.